Life is a soap opera, especially for Elle Miller, who writes for one. (Ellen dropped the “n” in her name in hopes of finding a better ending for herself.) When her laptop crashes, she borrows her recently deceased dad’s computer and gets way more than she bargained for. Elle unravels mysterious communications from his computer, while her mom decides to give Internet dating a try. As Elle tries to save her career at I’d Rather Be Loved with a storyline featuring a trip through Atlantis, she takes a trip to the Emmys, and finds herself in the middle of a romance between a real doctor and a hunk who just plays one on TV. Friends, family, and clues from “the other side” all help Elle figure out the difference between living the good life and living a good life. I really enjoyed this book! 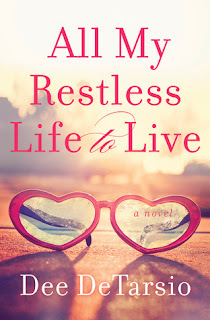 All My Restless Life to Live is a fast-paced, quirky, and amusing read! I have been known to watch a soap opera or two in my day thanks to growing up with two grannies who were dedicated fans (I actually still watch General Hospital – the only one of four I grew up aware of still on the air) so I couldn’t wait to read this insider look into the soap opera world. And I wasn’t disappointed. Events in Elle’s life unfold like the soap opera she writes, and I loved reading all this crazy, unusual, and heart-warming story. This novel was so much fun to read, has multiple quirky characters, and a plot that moves along quickly. Add to this a mysterious, paranormal element and I was hooked. The unusual antics of Elle's deceased father’s laptop kept me reading, as did her day-to-day life and her love life. The relationship she has with her mother is amusing, and I loved the dance they do around each other and their gradual understanding. The laptop coming between them caused some giggles, and I couldn’t wait to see what would transpire. Something that surprised me was that the soap opera scenes didn’t hold my interest. I actually could have done without them as I found myself skimming parts to get back to Elle’s story because I missed it so much when it was gone! Also surprising was how light DeTarsio manages to make this novel feel considering much of it is about Elle overcoming her grief over her father’s death. Not that this is to say that the entire novel is light and fluffy. To me, this book had the perfect balance of humour, depth, and reflective moments as Elle moves forward with her life. The witty banter between characters had me giggling and fully amused, and the two swoon-worthy male leads vying for Elle’s affection kept me flipping pages to see who would win her love. Several scenes had me snorting on the subway, particularly one where she is cast in her own soap opera. All of the characters in this novel are fabulous, and I particularly loved her friend, Adam, and loved to hate her loathsome boss, Liam. Elle’s internal dialogue is balanced perfectly with a fast moving plot. It doesn’t take away from the story or becoming overbearing or boring as I’ve witnessed some do. Many will be able to relate to Elle because of this. Pick up All My Restless Life to Live today if you’re looking for a fun, easy, and often amusing read! Thank you to Dee DeTarsio for our review copy. All opinions are our own. Hi Lydia! Thanks so much for reading and reviewing (and liking!) All My Restless Life to Live! I had a lot of fun with this story! Thank you again, and take care! You're welcome, Dee! Thank you for such a lovely book!